Just about two days after the journey of 11 school students ended before the destination, the Punjab and Haryana High Court today ordered an interim compensation of Rs 5 lakh each to the families of the deceased children. Union Minister Kumari Selja here today called on bereaved families of 11 schoolchildren who died in a school van-truck crash on Monday to provide succor to them. Does a high court, in exercise of its power under Articles 226 and 227 of the Constitution, has the jurisdiction to issue any direction to the Speaker of a State Legislative Assembly in respect to a pending disqualification petition against an MLA under the anti-defection law? Ajay Singh Chautala, INLD leader and son of former Haryana Chief Minister OP Chautala, today told the Delhi High Court that the charges against him in a disproportionate assets case be quashed as he was not a public servant at the relevant time. More than 500 acres of the cropped area of Badwasni village was waterlogged following a wide breach in a Delhi parallel carrier channel of the West Yamuna Canal near the village last evening. A former IAS officer, RN Prashar, was sworn in as the chairman of the Haryana Electricity Regulatory Commission (HERC) by Power Minister Ajay Singh Yadav here today. An officer of the 1975 batch, Prashar, has also worked as Financial Commissioner and Principal Secretary (FCPS), Power, for a number of years. Haryana has directed state power transmission and distribution companies to pay uniform wages to skilled and unskilled labour in various categories throughout the state, relaxing the provisions of the government's outsourcing policy, official sources said. A shortage of officers is staring the Bhupinder Singh Hooda government in the face.With at least six senior IAS officers going on deputation to the Centre and a few others in the process of leaving the state for “greener pastures”, certain officers are groaning under the weight of two or three departments. 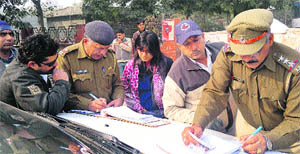 More than 150 persons, including policemen, were challaned on the fourth day of the road safety week today on charges of violation of traffic regulations. Even as the district police is observing “Traffic Safety Week”, two persons died on the spot and five women were seriously injured when a Jeep carrying passengers collided with a pick-up van near Saniana village in this district today. Five girls were injured, three of them seriously, when a Maxi Cab in which they were travelling met with an accident near Sadhaura last night on the Kala Amb-Sadhaura road. Intense cold wave conditions and dense fog enveloping the region has badly disrupted normal life, forcing the administration to close all government and private schools in Karnal district from January 5 to January 16.The mercury dipped to 5°C in Karnal while the day temperature also fell sharply to 17°C, two degree below normal. The Gurgaon district administration has launched a drive to ensure that school buses and other private vehicles carrying schoolchildren adhere to the safety norms and comply with the directions issued by the Supreme Court and the Punjab and Haryana High Court in this regard. A youth fired several shots at another youth in Chandan Nagar on Balsamand Road here. Tarun told the police that he had purchased a plot in the colony and was sitting there last evening when 10 persons arrived there in two cars. They began firing at him. However, he managed to escape. Lack of sanitation in the town has drawn the ire of local residents as well as the municipal councillors. A 60-year-old motor mechanic. Prehlad Singh, was killed when earth around a well he was in caved in. As mnay as 35 persons donated blood at a camp organised by Youth Congress activists to celebrate the 34th birthday of Deepender Singh Hooda, MP, at Kolsi today. The Bench of Chief Justice Ranjan Gogoi and Justice Mahesh Grover also directed the payment of Rs 1 lakh compensation to the injured. The Bench made it clear that the injuries had to be assessed by the competent authority. Acting on a petition filed in public interest by advocate Prithvi Raj Yadav, the Bench also directed the Deputy Commissioner and the SP to file an affidavit on the compliance of judicial directions on plying of buses and road safety. In his petition, advocate Yadav has sought directions to the states of Punjab, Haryana and Chandigarh, along with other respondents, “not to allow school buses/vans to carry students beyond the capacity of the vehicle and to stop overspeeding and to follow the speed limit of 40 km/h”. Directions have also been sought against allowing “a single bus/van to take several rounds for bringing children to schools” and to take them back home. The petitioner added directions should also be issued to ensure the compliance of rules for plying of school buses. Action be taken against the erring school. Referring to The Tribune report, the petitioner asserted he was shocked to read about the death of 11 school children. “From the report, it is clear that a small vehicle having the capacity of 10 was carrying more than 30 children and was running at very high speed and fog and alleged negligence of the truck driver led to the shocking incident”. He added Haryana has only declared a meager compensation of Rs 25,000 to each of the parents of the deceased children. “The state for its inaction and sthe chool management for its over-zealous and greedy action should also be burdened with heavy costs in the form of compensation to the parents of injured/deceased children,” he further added. She expressed her profound sorrow and grief over the death of schoolchildren in the tragic accident near Saha in Ambala district. 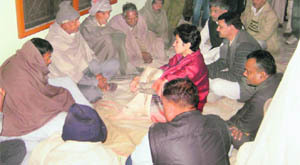 Selja met family members of the deceased in Pasyala, Sabka and Dinarpur villages and conveyed her condolences to them. She also wished a speedy recovery to the injured who are under treatment at Military Hospital, Ambala Cantt, and GMCH, Sector 32, Chandigarh. She said she would provide all possible help to the bereaved families. This is one of the questions of law raised by Haryana Speaker Kuldeep Sharma in his petition filed before the SC challenging the December 20 judgment of the Punjab and Haryana High Court directing him, among other things, to decide the disqualification petitions against five former HJC MLAs on or before April 30. Attorney-General of India Goolam E. Vahanvati, who appeared on behalf of the Speaker before the apex court, himself answered the question by saying that the SC had categorically declared in the Kohoto Hollohan versus Zachillhu case that the HC had no such power. The SC today stayed the operation of the HC judgment. The petition further contended that even if it was assumed that the HC had the power of judicial review over the decisions of the Speaker in respect of the disqualification petitions, the question was whether one constitutional authority, the HC in this case, could issue mandatory directions to another constitutional authority (the Speaker), for disposing the disqualification petitions within a specified time, as if the later were subordinate to the HC. Vahanvati said one could understand a polite request being made, but not an order dictating how the Speaker should exercise his quasi-judicial powers. The petition also urged the apex court to answer if a HC, under its writ jurisdiction, could judicially interfere with the disqualification proceedings pending before the Speaker and pass an order of “temporary disqualification” of an MLA, notwithstanding the settled law that a superior court could not exercise the original jurisdiction conferred by law on another court or tribunal. The petition also raised the question whether a Division Bench of the HC could suo moto raise doubts on the bona fides of the Speaker about his handling of the disqualification petitions when the petitioner himself had withdrawn all allegations of mala fides made in the writ petition before the Single Judge. Chautala has challenged the special court's order, which paved way for his trial in a case for allegedly possessing wealth exceeding his known sources of income. "I was not a public servant till May 24, 1993, when the CBI's alleged check period began. Can a retired government servant be treated as a public servant and prosecuted just because of the fact that he is getting pension?" 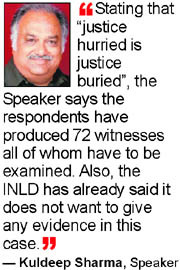 the counsel for Chautala told Justice ML Mehta. The court, which did not issue a notice to the CBI on the petition, has fixed the matter for hearing on January 17. During the hearing, the lawyer said none of the accused was a public servant at the relevant time considered by the CBI while computing their alleged disproportionate assets. The counsel for the CBI opposed the plea of Chautala saying the issue has already been settled by the SC when the Chautalas had challenged the trial court's order taking cognizance of the offence in the case. Earlier, the lower court had framed charges against Chautala under the Prevention of Corruption Act after finding prima facie sufficient material to proceed with his trial. The CBI, in its chargesheet, alleged Chautala's assets was found to be 339.27 per cent more than his legal income between May, 1993 to May, 2006. His legal income during that period was Rs 8.17 crore while he had acquired assets worth Rs 27.7 crore, it had said. Chautala, in his petition, said he was not a public servant as on May 24, 1993 and hence, his trial for allegedly acquiring assets disproportionate to his known sources of income for the period May 24, 1993 to May 31, 2006 was against the Prevention of Corruption Act. The lower court had earlier said a prima facie case for framing charges under the Prevention of Corruption Act was made out against Chautala for acquiring disproportionate assets. It had said the sitting Haryana MLA has "failed to give any explanation with regard to assets accumulated by him. He has failed to disclose the legal sources from which he acquired such assets.” It has also come on record that he has purchased properties in the name of his co-accused Chet Ram, Om Prakash, Abhimanyu Singh, Rajender Kumar and Net Ram, the lower court had said. The charges against the five other co-accused had also been framed. On receiving information of the breach, Deputy Commissioner Pankaj Aggarwal, senior officials of the Revenue and Irrigation departments reached on the spot. The DC asked the Irrigation Department officials to take immediate permission for stopping the flow of water in the channel and use all means to plug the breach as soon as possible. After stopping the flow of about 400 cusecs of water in the channel from Khubru diversion head, it took around 20 hours for the administration to completely plug the breach with the help of the JCB machines and labourers. According to Jag Niwas, SDM Sonepat, said the breach occurred after a sugarcane loaded tractor-trailer broke an electricity pole, which resulted in loosening the erection of another electricity pole at the bank of the channel. This led to sipping of water from the channel and gradually the canal was breached. He said the Revenue Department officials had been put on duty to assess the losses and flooded area. The demand for compensation of the losses would be forwarded to the higher authorities for consideration and necessary action. However, farmers said the cropped area of around 900 acres had been flooded by the gushing water and crops mainly of the wheat had been submerged in the water. The farmers had spent lot of amount in growing this damaged crop and the government should order a special girdawari of the damaged crops in order to compensate the damages. Among those who attended the oath-taking ceremony were Dheera Khandelwal, FCPS, Women and Child Development; Jyoti Arora, Special Secretary, Power; SC Chaudhary, FCPS, PWD (B&R); Ajit Mohan Sharan, FCPS, Finance and Power; AK Singh, MD, UHBVN, and members of the HREC. "As per the directions of Chief Minister Bhupinder Singh Hooda, skilled and unskilled labour would now be engaged on a contract basis by the transmission and distribution companies at a uniform rate throughout the state instead of the rates fixed by the Deputy Commissioner under the outsourcing policy earlier," State Power Minister Ajay Singh Yadav said in a press release note. The minister said the rates fixed by the DCs in the districts had a lot of variations and the jurisdiction of the transmission system divisions in Haryana Vidyut Prasaran Nigam Limited (HVPNL) was not district-wise. This, coupled with the retirement of at least 15 senior bureaucrats this year would make the officers’ crunch acute, affecting even routine administrative work in the state. Jyoti Arora, MD, Haryana Vidyet Prasharan Nigam(HVPN) and Special Secretary, Power, is the latest bureaucrat to join the Centre as Joint Secretary in the Union Power Ministry. Similarly, Mehtab Singh Gill, Chief Executive, Haryana Khadi and Village Industries Board, has been posted as GM, FCI, Haryana region. Besides, other senior officers-Madhusuan Prasad, Chairman of the HVPN and Financial Commissioner and Prinicipal Secretary, Power, has also gone on deputation to the Centrel. SK Gulati, Financial Commissioner and Prinicipal Secretary, Housing, has joined as the Chief Vigilance Officer of the DDA. Others who left the state for deputation to the Centre included Vijendra Singh, Director(Secondary Education), who is tipped to be a Director in the Ministry of Human Resources Development. Similarly, Keshni Anand Arora has also gone a central deputation and is posted as Deputy Director-General, Unique Identification Authority of India(UIDAI). While PR Bishnoi retired on December 31, others IAS officers set to retire this year included Chief Secrerary Urvashi Gulati, Raj Kumar, Anita Chaudhary, Manik Sonawane, SK Joshi, NK Jain, Maha Singh, Vimal Chandra, Fateh Singh Dagar, MP Bansal, MK Mahajan, Pushp Raj Singh, TK Sharma, JS Ahlatwat, and BS Malik. In fact, it was only today that the state government named RP Gupta and Suprabha Dahiya as the Commissioners of Ambala and Rohtak Division, respectively. These posts had been laying vacant for quite some time. The traffic police targeted two-wheeler drivers today who were driving without helmets. During checking at the Mini Secretariat here, several lawyers who were not wearing helmets were challaned. Ashwin Shenvi,SP, said policemen would visit educational institutions tomorrow and explain traffic regulations to the students. They would check all buses and four-wheelers owned by the schools for any violation of norms. He appealed to the public to intimate the police about road accidents on the Police Control Room telephone No 100. He said he himself supervised all calls received to ensure that timely action was taken by the police. Faridabad: At the end of the third day of a campaign against drunken driving in this city on Wednesday, the number of persons booked by the police has reached 1215. While 60 of the culprits were taken into police custody, the others were challaned. The police is serious about enforcing road rules since SS Kapur took charge as the Commissioner of Police, Faridabad, about two months ago. The police yesterday challaned 10 school buses for violating safety rules. The police said errant school buses and the school managements concerned would be dealt with strictly if they failed to conform to laws. The Jeep was plying illegally and ferrying passengers on the Uklana-Bhuna route. Ram Pal (40) from Chamarkhera village, near Uklana, was coming towards Bhuna with passengers in his Jeep when the pick-up van allegedly hit its side and sped away. Ram Pal and a youth, Ashok, died on the spot while five women passengers of the jeep were seriously injured. Driver of the Maxi Cab reportedly lost control over the vehicle due to fog hitting a tractor-trolley before veering off the road. Deputy Commissioner Neelam P Kasani said the decision would be binding on all schools. Meanwhile, thick fog engulfed the region in the morning, reducing visibility to a few meters. Vehicles were forced to move at a snail’s pace with headlights on even after sunrise. Four members of a family were injured when their car collided with a truck at Chirao Maur, 7 km from here, on the Karnal-Nissing road due to poor visibility today. While Poonam, Suman, Ashish were rushed to the civil hospital here, five-year-old Khushi, who was seriously injured, was referred to the PGI, Chandigarh. Traffic jams at main crossings in the town and peripheral areas was a common sight as fog made driving hazardous and risky. The trains were running behind schedule owing to dense fog. District Magistrate PC Meena has invoked Section 144, Cr PC, to enforce these guidelines strictly in the district and directed all officers concerned to launch a checking drive jointly. On finding any violation, the guilty will be booked under Section 188, IPC. The school managements/owners and Principals will be held responsible for absence of safety measures in the school buses and other vehicles and the drivers will be held responsible only for their driving-related offences. The school managements have been given 15 days to ensure compliance with the safety norms. After this, they will have to give an affidavit to the Secretary, Regional Transport Authority (RTA), to the effect that the safety measures in their school buses/vehicles were as per the courts’ directions. Meena said the private vehicles like vans, cabs, and rickshaws being used to carry the schoolchildren would also have to adopt the safety measures mentioned by the court. If any violation was found, the vehicles will be challaned. The parents can also complain if the school buses lack the safety norms. They can send their complaint to the Gurgaon Traffic Police on Facebook, inform the Police Control Room on phone No 100 or 0124-2316100 or the Deputy Commissioner’s office on phone No 0124- 2325500 or 2321144. The complaints can also be sent on the official e-mail of the DC on dcgrg@hry.nic.in. The passersby caught hold of Budh Ram of Gangwa village who was firing the shots. They roughed him up before handing him over to the police. The police said the two had an ongoing property dispute. In another incident on Monday evening, a youth fired two shots at another youth near Padav Chowki here. The police has arrested Rajesh of Kumharan Mohalla in the connection. A pistol has also been seized from him. He had fired two shots at Shamsher Singh of the same colony. The police believes that a monetary dispute led to the incident. Shamsher Singh had gone to the market for getting his vehicle repaired. After some time Rajesh arrived there in a car. The duo had an altercation following which Rajesh fired at him. Fortunately, Shamsher Singh escaped unhurt as he quickly ducked behind other vehicles parked there. Rajesh fled from the scene after the firing. He was later nabbed. Meanwhile, HJC legislator from Adampur Renuka Bishnoi has alleged that the goondas were active because of the support of ruling party politicians and police officials. In a statement she said the law and order situation in Haryana had been deteriorating steadily after the Hooda government came to power seven years ago. Two municipal councillors from the town - Wazir Jakhar from Ward 13 and Darshan Nagpal from Ward 19 - voiced their protest against the lack of sanitation and a slack attitude of the municipal authorities in improving the conditions at a meeting held here. Prahlad Singh Gillankhera, chief parliamentary secretary, and Virender Narang, president of the municipal council, were present. The councillors alleged that despite tall claims, the situation on the ground continued to be dismal. Jakhar alleged that the situation was so bad in his ward that heaps of garbage, filth and squalor could be found in the streets. He alleged that the contractor of safai karamcharis had been showing much more personnel in the record books than were actually working for him. Ward 19, represented by Nagpal, is considered one of the few posh colonies of the town, but the sanitation here, too, is bad. Ironically, the authorities had launched a special sanitation drive in the town recently. The authorities had announced that they would make Fatehabad free from squalor with this drive. Meanwhile, Gillankhera inaugurated the new meeting hall of the municipal council and also inaugurated the streetlight project of the town. The incident took place at Mattarshyam village of the district last evening. The deceased had entered a 40-foot well to repair a tubewell motor. The well’s wall was not bricklined. Suddenly, earth from the walls caved in burying him. The tubewell owner’s son who went down to rescue the mechanic was also partially buried under soil but he managed to come out. Policemen and villagers reached the site and three JCB machines were deployed to remove the soil. SDM Amardeep Jain supervised the rescue operations. It took about six hours to rescue the mechanic who was rushed to a hospital where he died. Suman, a girl student of Karoli village, donated blood for the sixth time in a row. The camp was inaugurated by prominent Congress leader Raj Singh Jakhar.